Despite all the wistful reminiscing about the demise of the Great American Station Wagon by enthusiasts too young to recall their mid-century heyday, truth be told most of those wagons weren’t really all that special. The average kids of the era were being shuttled about in ubiquitous land barges like the Ford Country Squire and Chrysler Town & Country. Few would have had any interaction with big block-powered rarities like the Mercury Colony Park or Chevrolet Kingswood Estate, let alone an Oldsmobile Vista Cruiser with a stonking Rocket V-8, four-on-the-floor with a Hurst shifter jutting out from the floor in front of the bench seat, and its slick glass roof. Imagine now for a moment how today’s sport/utility vehicles will be remembered some half-century hence. Ford Explorers and Jeep Grand Cherokees will be thought of as the Country Squires and T&Cs of the day, but thanks to the wealth of fire-breathing M and AMG-badged monsters, 707-horse Trackhawks and the like, the modern equivalent of the musclecar-era super wagon won’t be so rare. This leaves fun and engaging outliers like Mazda CX-5, which lines up well with the Vista Cruiser. Yes, we know, their powertrains are wildly different, but stay with us here. The new CX-5 has been styled to help it stand out in a veritable sea of look-alike crossovers, much like the Olds wagon did. And it has decent road manners and ride quality, without trying to be a tall, five-seat MX-5 Miata, just as the Vista Cruiser wasn’t trying to be a family-size 4-4-2. 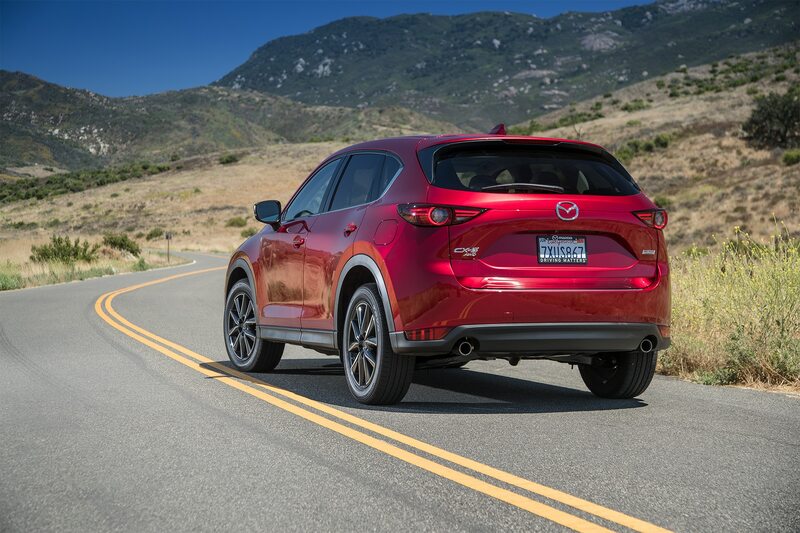 We actually had the past in mind when we chose to add a 2017 Mazda CX-5 Grand Touring to our Four Seasons fleet, though we weren’t thinking as much of classic wagons as we were of the 2013 CX-5 we also had in for a long-term evaluation. That first-gen CX-5 wowed us with how enjoyable it was to drive for a midsize crossover, and it never gave us a bit of trouble (though it spelled plenty for an unfortunate deer that struck it head-on). 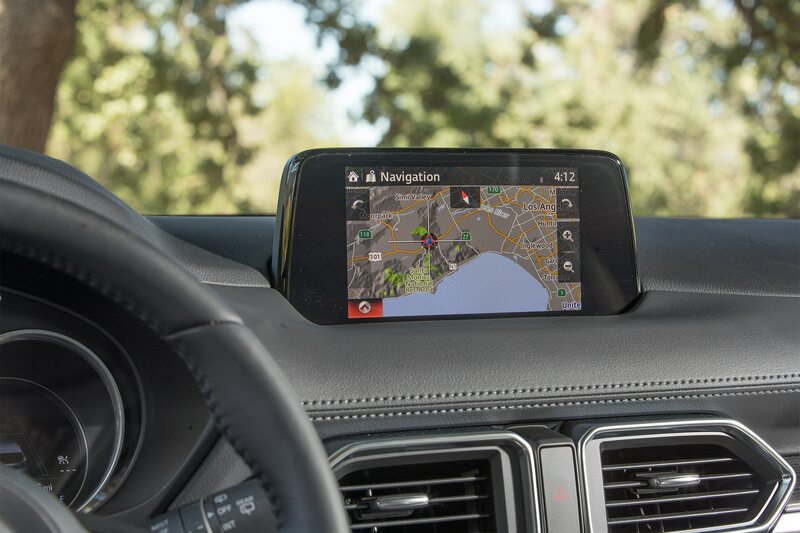 We wanted to see if the second-generation CX-5 could repeat the feat. One feat the midsize Mazda crossover has been pulling off almost singlehandedly is levitating the fortunes the small, independent Japanese automaker. At one point during 2018 the CX-5 outsold Volkswagen’s Atlas, Tiguan, and Touareg combined. We don’t need to remind you that Mazda’s mainstream SUV sales help ensure a future for cars like the MX-5 Miata. And while we adore the Miata, an area where we’ve had some issue with it as well as the CX-5 is in the motivation department. 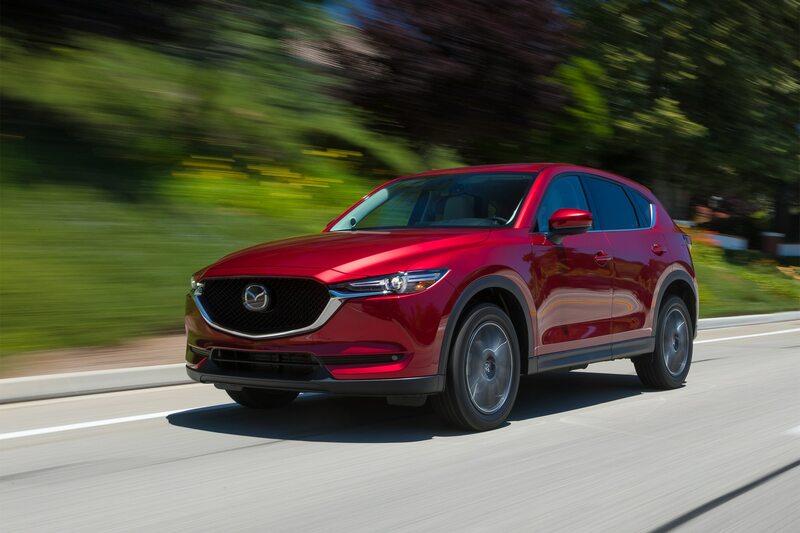 The naturally aspirated 2.5-liter four with 187 horsepower and 185 lb-ft of torque under the hood of the CX-5 sounds good on paper and likely offers more than adequate power for most of its intended customers. But we’re not most buyers. We wanted more go. 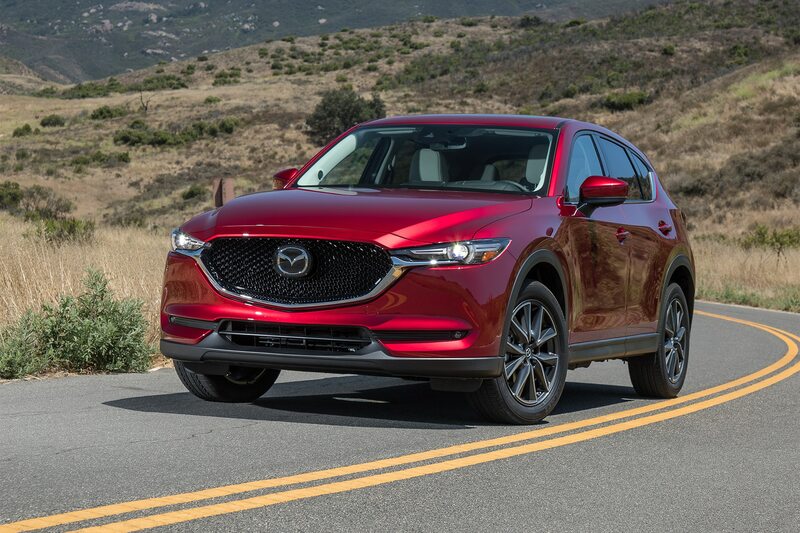 “Mazda is outperforming its competitors on every front when it comes to look and feel at a given price point,” senior editor Nelson Ireson says. “The only thing that’s not leading the game is powertrain tech, and that’s pretty obvious once you get behind the wheel. At around 8.6 seconds to 60 mph, the CX-5 gets up to speed acceptably, but as Ireson and others on staff found out, it lacks some giddy up in situations where you could use more of it. “My biggest complaint is that the car’s dynamic proficiency highlights its lack of power, especially for passing on the freeway,” social media editor Billy Rehbock says. Some editors wondered whether the 227-horse turbo four from the CX-9 would fit under the CX-5’s hood, perhaps as some sort of Mazdaspeed version (remember those, Mazda fans?). There is one other engine option coming soon (or at least we keep hearing it is) for the 2019 model year, however, in the form of Mazda’s long-awaited 2.2-liter turbodiesel four, which is tentatively rated at 173 horsepower and 310 lb-ft of torque. It should add the low-end grunt Ireson was looking for while marginally increasing fuel efficiency over the gas-powered engine. Speaking of mpg, during our time with the CX-5 we recorded an average fuel economy of 24.5 mpg, which limboed under the EPA’s 26 mpg combined figure. It’s not all that surprising though considering how much we normally keep the hammer down around town—all in the name of evaluation, mind you. Feelings throughout the staff were basically reversed when the subject turned to the CX-5’s dynamic chops. Although some thought it a bit softer than the first-gen model given its bigger dimensions and tuning that seemed more toward the comfort end of the spectrum, the new CX-5 was lauded for its precise steering that offers more feedback than most of its segment competitors, and overall poise on all manner of pavement. 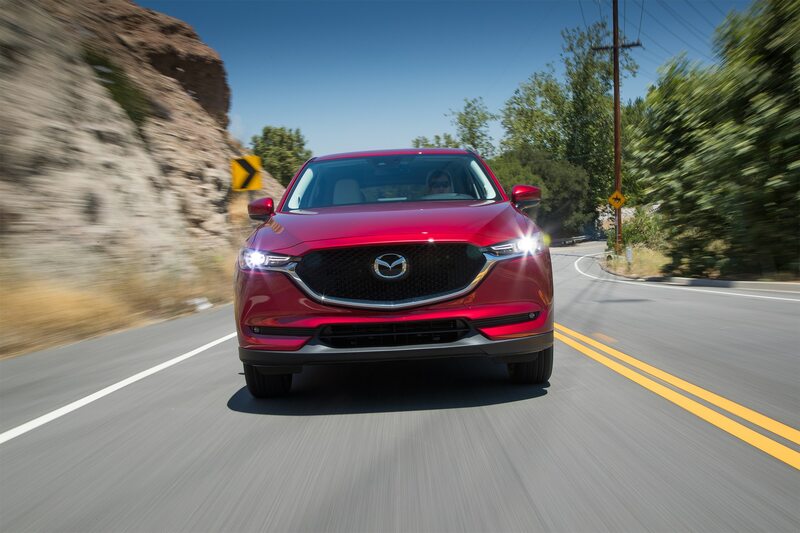 The sentiment was much the same when the topic turned to the CX-5’s exterior style, which featured a killer Soul Red Metallic sheen on our test vehicle and attractive 19-inch rims. Praise was nearly universal for the Mazda’s sheetmetal, a design that takes some chances but generally speaking works instead of sticking out for the wrong reasons. It’s one of the key differentiators between the CX-5 and the rest of the midsize crossover crowd. 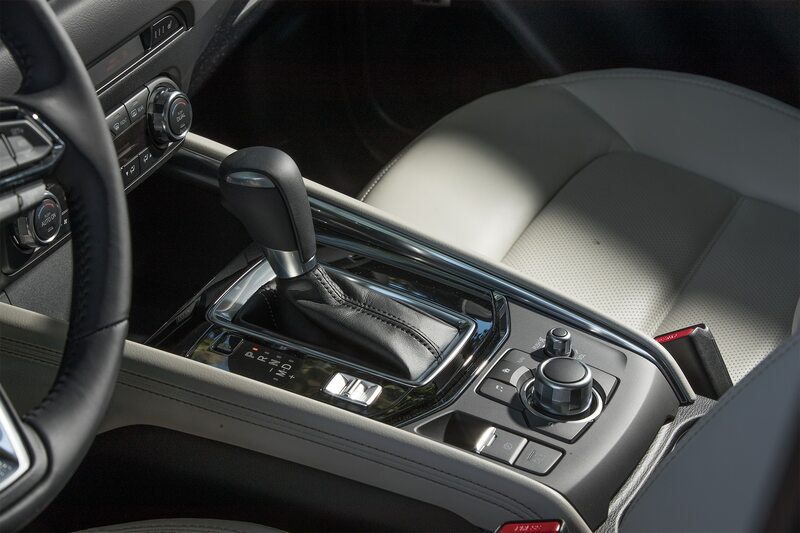 That premium feel at an affordable price point philosophy extended to the interior. 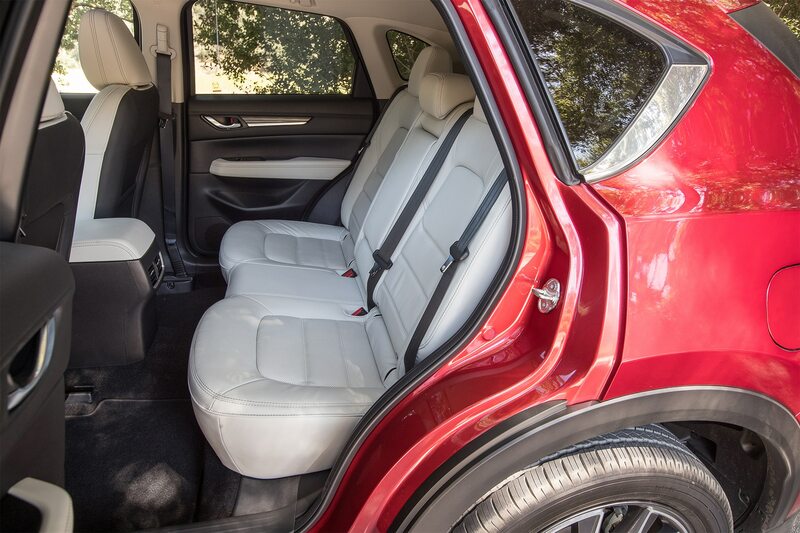 Materials had a near luxury look to them, and yet weren’t so precious as to worry about the effects of the sort of family travel for which this two-row SUV is intended. Given the comfortable cabin seating was swathed in a bright “parchment” white, keeping it clean was a bit of an issue, but thanks to a proper detailing it looked pretty much good as new when we turned it in. The L.A. staff mostly used the CX-5 as a daily commuter, weekend errand-runner, and for the occasional short trip, but it got a cross country workout thanks to yours truly, who drove it north by northeast, through Reno, Nevada, and on to Jackson Hole, Wyoming, before heading back to the Motor City. 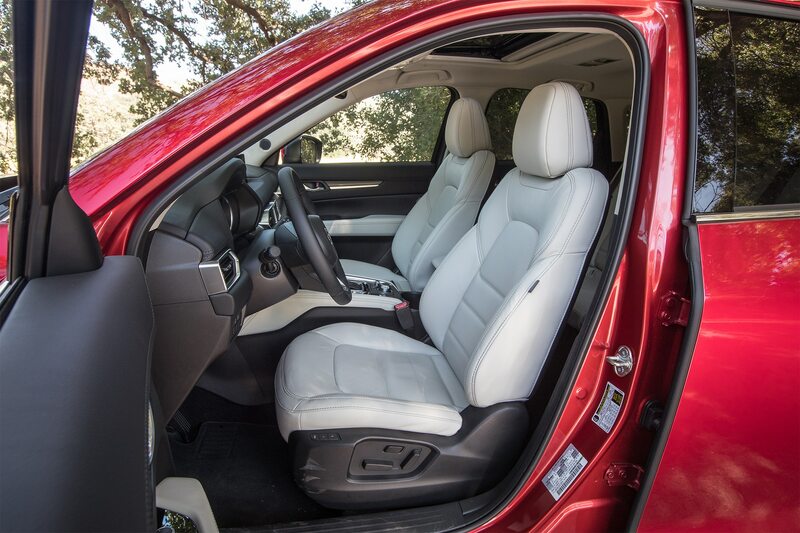 Once there, the Mazda CX-5 often had its back seat folded, with sheets, blankets, and doggy beds protecting the interior from a surfeit of collie hair. (There were frequent stops at powerful car wash vacuum stations.) My wife and I also used it to help relay an adopted dog to his new owner. Thanks to the CX-5 and Above and Beyond Transport, an English setter named Murphy had a comfortable ride from Detroit to Marine City, Michigan, his last 50 miles of a journey that began in Goochland, Virginia. We also used it for a couple of 360-mile round trips to our “Up North” cabin with the big dog in the family, a 100-pound rough collie. During its 19,000 plus mile stay in our care, the CX-5 proved absolutely trouble free, with the only maintenance being a couple of oil changes and switching on and off a set of Bridgestone Blizzak winter rubber that we sourced from our friends at Tire Rack. Chalk up at least one young enthusiast who will have fond memories of this family wagon some four or five decades hence.